Killing bed bugs by freezing them using liquid nitrogen is a relatively new treatment methodology. Freeze treatments are best used in conjunction will other treatment methods. It provides a fast knock down of bed bug populations and the cold temperatures have been proven to kill bed bug eggs with 100% efficacy. Have you ever been to a night club or a concert and it starts to get really, really hot? It is about that time when the venue will pull out their Co2 Cannons and instantly cool the place down. Liquid Nitrogen in a can is similar. Safe, effective, clean. The Icy Hand of Death ... Literally. The University of Minnesota has created some great information on the effectiveness of killing bed bugs with freezing temperatures. Essentially, the reason why freezing bed bugs works is because the freezing temperatures cause ice crystals to form inside the bed bug severely damaging the cellular structure of the bugs usually resulting in death. But, it needs to get cold! Our freeze treatments are great for small items picture frames, the bindings of books, small ceramic figurines. 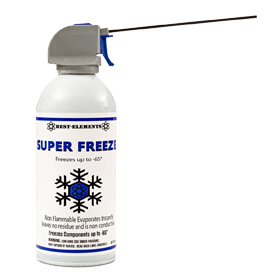 We can instantly drop the temperatures of treated areas to (-65 °F)! That is cold-- deathly cold. HeatRx brings freezing temperatures to California! Liquid Nitrogen is a fantastic tool but it works best in conjunction with other treatment methods. We will often use Liquid Nitrogen to treat sensitive materials like picture frames or religious artifacts that require a gentler touch.